A recent letter to the editor here in Arkansas perfectly portrays the bizarre mindset of certain Christians. The author wrote not about morally-bankrupt Trump, nor about people dying from chemical warfare and barrel bombs, nor about the continuing horror of mass shootings in our gun-mad country. No, that wasn’t the source of this woman’s righteous indignation. She’s upset about a comic strip. People should be very careful when targeting others, especially those of us who will indeed make a stand for our God and his precious son, our lord and savior Jesus Christ. Our beliefs and our love for spiritual and heavenly knowledge and healing far supersedes anyone or anything this world (earthly) has to offer. Oh, my. Where to begin? Might one suggest that she and others of her ilk SIMPLY NOT READ WUMO? I mean, does that not seem the logical choice here? I go to the comic pages pretty much every day, but I only read four. Those are the only ones I enjoy. Perhaps this Christian extremist doesn’t understand the concept of enjoyment but rather flogs herself through a daily exercise of holy suffering by reading comics that enrage her. This would be highly amusing to the rest of us if it weren’t for the awful reality that such people have no idea how ridiculous they are. They are convinced that the world must operate by their rules and anything that draws their personal censure is surely Wrong. A long list of human tragedy unfolds from this viewpoint. The Inquisition springs to mind, an endeavor of the Catholic Church beginning around 1100 AD and continuing in various forms for the next 600 years. Any form of “blasphemy and sacrilege” could result in church leaders taking offense similar to our letter writer. Sometimes it was difficult to guess, as any of the following were considered serious crimes: changing bedding on a Friday, not eating pork, dressing in certain ways, wearing earrings, speaking in foreign languages, owning foreign books, casual swearing, criticizing a priest, or failing to show due reverence to the Inquisition… People were executed for failing to fast during Lent, for homosexuality, fornication, explaining scientific discoveries, and even for professional acting..
Or, in our case, publishing a cartoon. 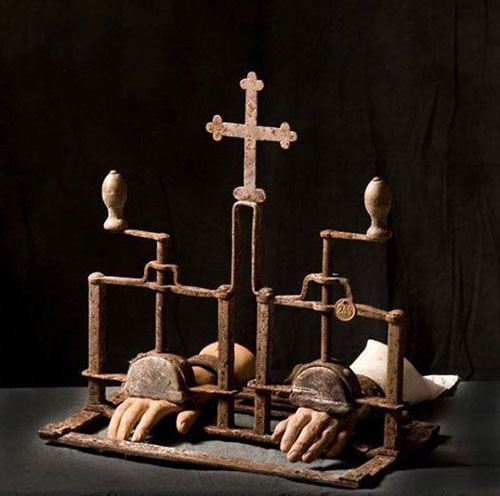 Generously, inquisitors utilized various forms of torture to provide the greatest possible opportunity for the accused to confess his or her sins. 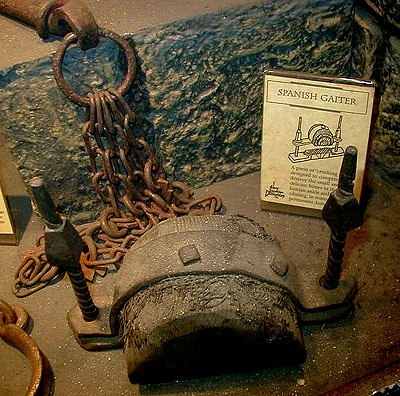 Serious effort went into the invention and construction of torture devices including the infamous ‘rack’ and various other gleeful methods of inflicting pain. When a suspect was convicted of unrepentant heresy, the inquisitorial tribunal was required by law to hand the person over to the secular authorities for final sentencing, at which point a magistrate would determine the penalty, which was usually burning at the stake although the penalty varied based on local law. What exactly is she suggesting? Would her “stand for God” include Inquisition-style discipline on the newspaper publishers or the creator of the Wumo comic strip? Sadly, we don’t have to look far, even today, to find exactly that kind of violence bestowed upon those who draw the critical attention of religious authorities. Syrian cartoonist Ali Farzat dared to make fun of certain leaders in his cartoons. Assailants hunted him down and used clubs to break his hands. Chinese censors called for a “severe punishment” for a star TV anchor over jokes he made at a dinner party mocking the People’s Republic of China’s founding father, Mao Zedong. Then there was the Islamist terrorist attack on the French satirical weekly publication Charlie Hebdo which resulted in the deaths of twelve people. Their justification? Charlie Hebdo made fun of Allah. There’s a reason we Americans treasure our right to free speech. We can criticize our leaders, laugh at Saturday Night live skits, and even poke fun at entrenched religious views, all without fear of having our hands broken or being burned at the stake. Somehow in all her years of life, this letter writer missed out on all but the first part of First Amendment to the U. S. Constitution. 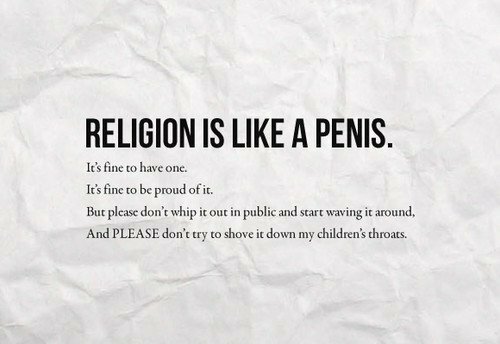 All this brings to mind the question of why certain religious types find it imperative to force their point of view on everyone else. Is that they are so insecure in their beliefs that they’re comfortable only if they’re certain everyone around them believes the same thing? Isn’t faith the foundation of religious practice, the assurance that no matter what happens, God’s got your back? Wouldn’t that pretty much cover being the only Christian in a sea of infidels? Why so insecure? Do these folks not understand that this exact attitude is responsible for most of the world’s suffering? Most of the wars? Most of the violence currently taking place in the Middle East? Education is a wonderful thing. But in a state where parents merely need to sign a form to withhold their kids from public schools and then indoctrinate them with whatever folderol fits their world view, people like this benighted letter-writer proliferate, aided and abetted by fundamentalist preachers who don’t hesitate to cast judgement despite the Biblical edict against judging. Judge not, that you be not judged. 2 For with the judgment you pronounce you will be judged, and with the measure you use it will be measured to you. 3 Why do you see the speck that is in your brother’s eye, but do not notice the log that is in your own eye? National educational standards exist for a reason. They put us all on a more-or-less level playing field where we all understand the basics of our rule of law, our history as a Western culture, and yes, even the good bad and ugly of religious traditions. Public schools also help us learn to exist in a multicultural, multiracial world where even cartoonists like the creator of Wumo possess as much right to their opinions and creative efforts as the person who goes to church every time the door opens. It’s a sad testament to the modern evangelical movement that such intolerance is not only accepted but encouraged. This letter writer seems oblivious to the irony in her remark about being “fair game for those who want to bully and disparage those with whom they do not agree…” That would be a thought to reflect on. This entry was posted in American Culture, Morality, Religion and tagged cartoons, freedom from religion, freedom of speech, intolerance, newspaper comics, religious extremists, separation of church and state, Wumo on April 24, 2018 by Denele Campbell.